Give your spinal decompression patients a mental edge to healing to help achieve faster, more effective, and longer lasting spinal decompression results. What is the BrainTap and How Can It Help Your Spinal Decompression Patients? 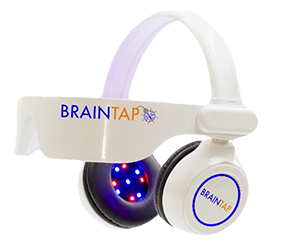 BrainTap is an extraordinary new technology that delivers gentle pulses of light through special glasses. These lights synchronize with tones known as binaural beats to produce deep and profound relaxation. These sessions can take a patient to a state of tranquility that is optimum for healing, focus, and accelerated learning. Whether you are trying to instill in a patient a positive mindset to healing or conquer bad habits contributing to the back or neck pain such as smoking, diabetes or too much weight then BrainTap is for your clinic. This extensively researched light & sound technology creates a perfect symmetry of sound frequencies and light synchronization for the ultimate in binaural brainwave entrainment and relaxation. The combination helps guide your brain to a perfect balance of left/right brain synchronization and relaxed brainwave activity. In other words, it produces the relaxation response, giving your body precisely what it needs to get back in balance and reverse the effect of stress on the body. At the same time, the sessions that power your brain, guide your mind to a state of laser-like focus so you can rid yourself of negative self-talk and achieve life goals! What are Some of BrainTaps Other Benefits? Four Technologies in One Life-Changing Device! Flashing light patterns train the brain to operate in the best mode for creativity, focus, and mindfulness. This brainwave entrainment can transform the listener into a mental powerhouse with the right mindset to accomplish just about anything. Imbedded tones guide the brain into states of deep relaxation. Within minutes the brain reaches extraordinary levels of focus and performance that would otherwise take years of practice to achieve. This helps listeners create a new self-image as a healthy, happy, optimistic person who no longer lets small things turn into stress. The music on every session is designed to create a full 360 degree experience that floods the mind with beautiful, serene thoughts and images. What Equipment Do I Need to Use BrainTap? All you need is the BrainTap glasses/headphones combination and whatever device you normally use to listen to music as long as it has an audio output. Any iPod®, iPad® MP3 Player Smartphone that plays MP3s, or your home computer or laptop will work with the BrainTap. Absolutely! The only known side effects are improved memory, better sleep, focus, concentration, and reduced stress. However, flashing lights have been known to cause problems in people who suffer from serious medical conditions like epilepsy, seizure disorders, brain injury, or photosensitivity. If you have any of these concerns, you should ask your medical professional if light and sound technology is right for you. What Happens During a MindFit/SMT Session? With the MindFit glasses (that resemble sunglasses) over your closed eyes and headphones over your ears, you are immersed in a perfect mixture of light and sound frequencies. Your eyes will be treated to a beautiful light show while you listen to specially designed music and the guided mastery process. This all combines to enhance your experience and invite a higher degree of alpha/theta brainwave activity. Some people may experience colorful geometric patterns while others may lose track of the lights completely. The light and sound pulse rate shifts from wide- awake beta to a dreamy drowsy state of theta as the session progresses. Using the science of frequency following response (FFR), your brainwave activity will follow the pulse rate of the ZenSync system. At the same time, your conscious mind rehearses the changes or improvements you desire for your life. What is it Like to Experience BrainTap? One of the best definitions of BrainTap came to Dr. Porter from a satisfied client, who said, "SMT feels like my body fell asleep, but my mind stayed awake." SMT is a natural state, very much like sleep. In BrainTap, you are provided information that you want to apply when you are awake. This is called anchoring your vision to your timeline. It works like writing yourself a sticky note and posting it somewhere to remind you later. Most people who want to make a change in their lives have the best intentions in the world, but the reality is, we get what we rehearse in life, not necessarily what we intend. Through BrainTap you rehearse the new behaviors, attitudes, and beliefs you want and create in your mind a timeline for success. During your BrainTap sessions, you visualize new responses to old behavioral triggers. Then, when you encounter the old triggers, you'll simply "forget to remember by remembering to forget." As your new responses take hold, you'll be convinced that you can be tobacco-free, or lose weight, or change any negative behavior. Generally speaking, any person can achieve alpha/theta brainwave states and can benefit from BrainTap. However, the sessions are recommended for persons with an I.Q. of 70 or above. Persons with severe mental disorders should not use the BrainTap. Flashing lights have been known to trigger seizures in certain cases. While this disorder is rare, people who have a seizure disorder of any kind should not use the lights. These people can still benefit from BrainTap without the lights. If you are unsure, ask your doctor before proceeding. In order to overcome the negative effects of stress, you need to get out of the fight-or-flight response and into the relaxation response. The relaxation response can't happen as long as you generate high beta brainwave activity. Your brainwave activity must dip into alpha, the intuitive mind, or theta, the inventive mind. Many believe that theta is the optimum state for creativity and that it's the only mode in which one can make a quantum leap in consciousness. Unfortunately, theta mode is difficult to maintain. This is where the frequency following response comes in; it keeps your brain engaged. By using the BrainTap your brain is being trained to generate more alpha and theta waves and fewer beta waves.